This is a guest post written by Brett Ladbrook from NZ who rides a modified GSX with sidecar. Well it’s that time of the year again. Winter. Mornings of -2 or -3 degree frosts, wicked southerlies and the occasional snow flurry. Rego and WOF has run out so time to take the bike off the road and give it a winter service. Rego in NZ is about $200 dearer than a car so most riders only register for 6 months. The GSX is starting to show 2 years of riding with chips and scratches in the paint and I really need to have a look at all the running gear to make sure its going to be a trouble-free summer. Trouble is you think you’re only going to do this and this, but when you start looking at it in-depth, there’s also this, this and that to do as well. So what tends to be a small list to fix or tidy up-its gets rather large and time gets away with you - especially when the workshop feels slightly warmer than your fridge. The bike was a full frontal wreck when purchased so I know the bike rather well. First off - is to strip the forks for a repaint and fresh oil. These haven’t been done since the second hand forks were put in, so it will be interesting to see how she rides with fresh oil. Leaving them standard when I first got them gives me a good bench mark as to how the original oil worked with the sidecar on. I ordered the fork seals after looking on-line to get the size and took the fork legs into the blasters, then into the powder coaters. Got everything back and fitted up the seals, only to find out the size was 1mm too high. I double-checked the old seal and the info I found online only to find the info was wrong. Note to self: next time check more than 1 site for parts info. Got the bro to order the correct size only to find out that that Aierte seal I needed was out of stock. Checked with Suzuki and the price would have been quadruple what I paid for the Italian ones. Solution was to get the spacer between copper bush and seal remade 1mm, yes 1mm thinner, as I have found in the past the Aierte seals are very good quality and didn’t want to change from these. You know how it is when you find a product that’s does you well you don’t want to change. 7w Belray fork oil to go in. Rant: OE parts prices are horrendous and this, I believe, is one of the reasons bike sales are so low and insurance is so expensive. It only takes a few parts to write a bike off and bikes are looked at, as a luxury item - not a cheap mode of transport anymore. Removed the pick-up cover, as my wheelchair had scratched it a couple of times. My pack frame, which has given me no end of trouble braking, from having the wheels on them, needs taken off and repaired. We’ve had numerous attempts at strengthening them, but to no avail. Both will get blasted and powder coated. Speedo removed and taken in to get checked as it’s been pretty intermittent. I had repaired it and was happy all was working, saved lots of dollars on a new set, but it does have issues. Got the instruments back and on the test bench it was working. Will need to look at the speedo pickup. Hopefully this isn’t the problem. At $190, Suzuki price, to replace it, really not keen on paying that, just for a pickup. Will see how this one pans out. Next on the list is to remove swing arm and rear wheel to check the bearings and replace the rear tyre. I have already replaced the front wheel bearings with tapered roller bearings. These should take the load a lot better than standard roller bearings which only lasted me 11,000ks. New rear tyre and sidecar tyre will be fitted as well. Sidecar body will be taken off the sidecar chassis and all welds and mounts will be checked. The chassis was built in the ‘70s and has already had extensive modifications due to it pulling out welds on a trip over the Port Hills when it was on my old FJ1100. 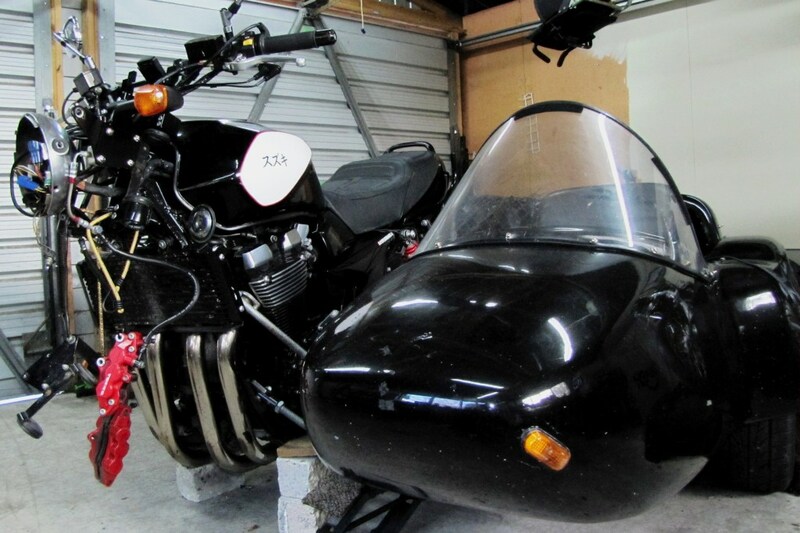 Rather unnerving that as the bike started to fall into the sidecar. Then all the sidecar mounting rods are coming off for a quick paint. 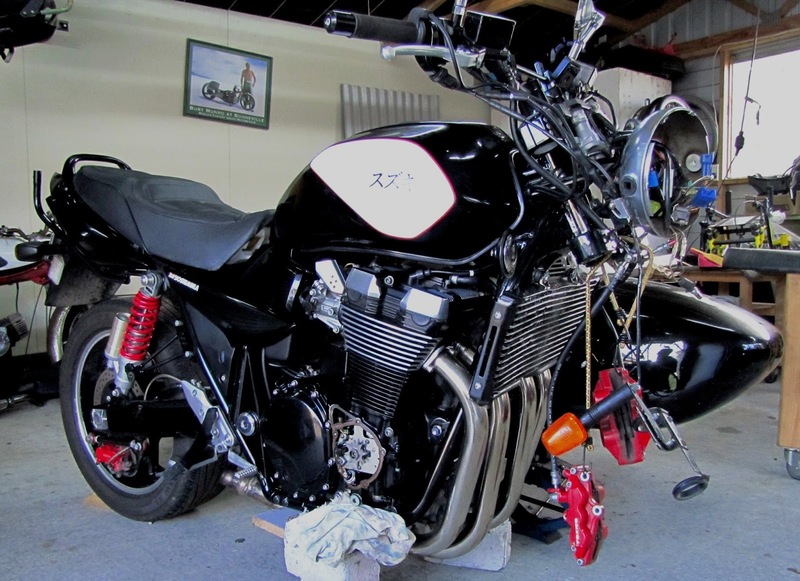 Debating on shortening the Yoshimura Ti-Oval muffler as it does have the odd dent in from the original accident this will give the big 4 a rowdier sound. May not be a good thing for long distance rides. 80% of the work is general preventative maintenance so winter, if you get a winter, is a good excuse to check some of this stuff out. Reading blogs and posts where people have had bearings collapse or really odd handling issues - it does seem general maintenance on some bikes has been slightly neglected. Fork oils and bearings have a huge impact on how the bike rides and yet it is something that we don’t check as regularly as we should. Usually when something fails. Question: How long have you had your bike? If its over 2 years and 15000-20000ks travelled, have you checked your steering head, wheel and swing arm bearings? changed engine, fork, gearbox and diff oils? checked nuts and bolts are tight? have you set up the bikes suspension for your weight and riding style? Setting up your bike’s suspension for yourself may be very different from the standard settings or the last chap that had set the bike up. It also affects the way your tyres work. Changing settings for 2 up riding and riding with luggage is well worth the 5 minute effort of twiddling and re-twiddling, if its not quite right. Write a note on your ph so you can remember what each setting is so it’s easy to change when you need to. So, after all this work the bike should in good nick for the summer season which for myself will start in October. The main event being the Burt Munro Challenge. A week of bike racing in the deep south of Invercargill. Rather looking forward to this again. Now that looks like another story for December. Safe biking.